East Ridge High School student athletes on National Signing Day. Adam Johnson ACGC High School Division 2 Football for Northern State via Snapchat. Halley Busse of GF@ signs with Wanyn State in Nebraska via Snapchat. 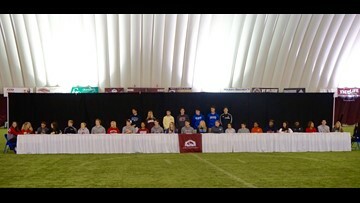 Eden Prairie student athletes on National Signing Day. via Snapchat. Grace Kugel from Chisago Lakes High School via Snapchat. Eagan High School student athletes via Snapchat.